Dedicated, caring professionals. Proven results since 1986. Since 1986, our lawyers have consistently achieved significant results in numerous employment law, family law, wills, estate litigation, commercial litigation and other civil litigation matters. We provide effective, diligent and assertive representation, always delivered with a human touch. Arrange an initial consultation without fee or obligation with one of our lawyers. Our Toronto law firm responds to all inquiries promptly. I sincerely appreciate all of the assistance and professionalism shown by Wise Law Office. I would absolutely recommend Wise Law Office to family and friends. Wonderful friendly knowledgeable. I would highly recommend this law firm for all your needs. Great law firm knowledgeable friendly great to deal with highly recommended. I need to preface this rating by saying that I was a lawyer until I jumped into business full-time many years ago. Garry was referred to me by another lawyer and mutual friend as I was going through an awful divorce that was exacerbated by some highly contentious and venomous issues. I asked for a referral to someone that was first and foremost practical and would not get dragged into the "destructive circus" that so many family matters become because of the ego and style of much of the Family Law bar. GARRY SHONE! He defended my interests without attacking my ex-spouse; he demonstrated extraordinary judgment and gave me sound, practical advice and best of all - when faced with a fire-breathing opposing counsel who believed that "higher decibels = higher client service", he calmly let her burn through her fuel without joining the chorus of pointless misery and money. His fees are very reasonable and he has a knack for understanding the needs of his clients. Mr. Wise and his team have provided me with over and above service. They were instrumental in assisting me with my employment needs. Their proactive approach and seamless execution were key in resolving and answering all my concerns. They both handled my situation with the upmost professional courtesy and I am very grateful for this outstanding service. These kinds of things really go along way to ensure customer loyalty. I would highly recommend Wise Law Office for your employment needs. I've sought Mr. Wise’s legal opinion a number of times for will and estate matters over the years, and have found him forthright and realistic. I've recommended him to friends, with success and have found he and his team responsive. I trust him and will continue to hire him when needed, and refer him. Dedication, professionalism & timeliness are key qualities any time I have sought out Mr. Wise’s expertise & assistance. I will always recommend Mr. Garry Wise & his law firm to anyone that may be in need of legal services, as his sound judgments, fairness & professionalism are bar none the best. Thank you for your support, consideration & dedication to making me feel confident I have made the right choice each & every time I have come to you for your services. Highly recommended. Garry Wise has represented and advised me on numerous occasions. I trust his professional knowledge. I trust his integrity. For me and my family, Mr. Wise has repeatedly demonstrated: extensive legal knowledge; interpersonal professionalism in dealing with me; thoroughness in conducting research / due diligence; creativeness in in anticipating adversarial maneuvers or possible outcomes; and, confidence inspiring competency as my representative in sensitive negotiations. I've recommended him to many friends & family in need of legal representation. Likewise, I would not hesitate in referring Mr. Wise to anyone seeking legal counsel. Garry Wise and his staff were courteous, prompt and responsive. The efficiency that he demonstrated brought swift resolution to our issue. We found the Wiselaw office personable, honest and upfront. Garry Wise offered prompt and courteous service and negotiated a quick and fair settlement. Thank you. Mr Wise and his staff handled my case with great professionalism and genuine care. The integrity with which he conducts his business, exceeded all my expectations. The compassion that he demonstrated put my mind at ease at a very trying time. Garry Wise has earned my trust through and through. I would recommend his service and expertise to anyone seeking a great councillor. I was very pleased with the service I received from Mr. Wise in regards to employment law. He was extremely knowledgeable and very attentive to my file. He did all that I could have expected and more! He was very professional and knew when to sit back and wait and when to act forcefully. He is obviously very experienced. I have referred several people to him and everyone has been extremely happy. The stakes are really high in these matters and it's really important to choose someone who knows what they are doing. He was the best! I have dealt with Garry wise for various different issues over the years. I find that he has superior legal skills and always approaches an issue with the objective of representing my best interests in the most efficient and effective way. I am tired of lawyers who try to inflate the bill by spending an excessive amount of time arguing with other lawyers while my invoice grows. Mr. Wise deals with any legal issues my family has had in a sensitive way and encourages resolution when it makes sense. I want to thank him and his associates for their sensitivity in dealing with a recent personal injury case for me. I have worked wit Mr Wise for many years and find him to be professional and knowledgeable. I would highly recommended him. I highly recommend him. His approach is direct and he is not a push over in court. I was happy to have him on my side at mediation and looked forward to emails from his staff to let me know what was going on. Great lawyer, settled my matter, no more stress! I am very content with my choice in retaining Mr. Wise. He and his staff were excellent and upfront with me throughout. His expertise in employment law has led me to highly recommend him to many friends over the years. Wise got me an excellent settlement a while back. He and his office kept me very informed by email. I highly recommend him and appreciated his help. I had an excellent experience with Ms. Bakshi and would recommend that anyone with an employment issue contact her. I had an issue and was set up with a free phone meeting within minutes by her office. She let me know what my rights were and made me feel much better. Recently, my husband and I had to seek employment law advice, found that Wise Law had the best reviews and sent them an email summarizing the issue. The very next morning Simran got in touch. After not one, but three! separate consults, several email exchanges and her seeking advice from her senior counsel on our behalf; she advised us of what was in OUR best interest at this time, not theirs. She gave us alternate suggestions as well. Simran spent much more than a half hour of her time with us and did not charge us a dime at the end for the advice. We were stunned but grateful. We had expected to pay something having gone way past the free half-hour initial consult. Clearly, she cares about people and about what she does and we would highly recommend her. Should we decide to pursue our case in the future, we will most definitely be contacting her again. Great Lawyer. Very Knowledgeable and gets results. I was referred to Garry over 10 years ago to act as my attorney for my divorce. The advice given was professional and very wise (pun intended 🙂 ). Garry is an expert in law, using his wealth of experience and knowledge to approach and settle the divorce. But also, his sense of humour allowed us to work through even the ugly times of divorce so that it was as painless as it could possibly be, considering the circumstances. I was very happy with the outcome of my divorce, as I ended up with everything that I'd asked for. Thank you Garry! I wouldn't hesitate to recommend Garry to anyone who is in search of a lawyer that will work tirelessly on their behalf to get the best possible outcome of their divorce. I continue to use Garry for other legal matters such as my will and POA's, and have been very happy with his work in that area as well. More solid wise advice! You rock Garry. I’m very fortunate to have met you when I needed someone in my corner, and as a concerned friend. Excellent professional, utmost integrity, positive and super smart person. Best bang for your dollar. Have been using his services for 20 years now! Garry has changed my life in the most positive way. The only thing you need to do is trust him! I highly recommend them! 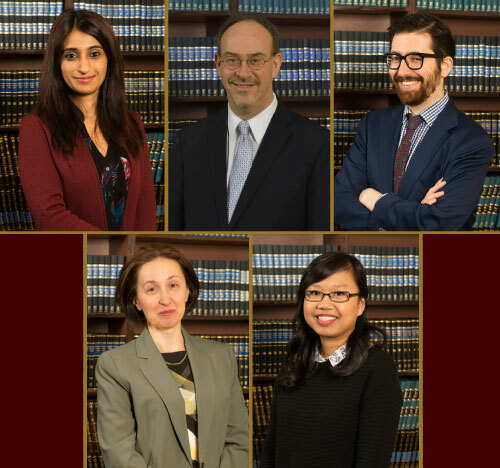 The WiseLaw team has always been courteous and prompt with providing sound legal services. Additional positives: Convenient near-subway central location. Great listeners. Able to see risks and opportunities tied to any of my legal dilemmas. Dedicated staff. I am forever grateful to Mr. Wise and staff. They were very dedicated to my case and I'm very thankful for the outcome. Their hard work, and devotion, made a wonderful difference in my life.I sincerely appreciate all of the assistance and professionalism shown by Wise Law Office. I would absolutely recommend Wise Law Office to family and friends. The contents of this website provide only general legal information and do not constitute legal advice. Readers should seek legal advice about their specific circumstances, and are expressly cautioned not to rely upon the materials published on this website to make any legal decisions. No solicitor and client relationship is created between Wise Law Office and our website visitors who have reviewed the legal information set out herein. Please contact our office if you wish to retain us, so that the appropriate retainer documentation may be provided for your consideration.